So I've officially signed up for one of those meal delivery services, but NOT the one I thought I was going to do. I've literally been thinking and reviewing and studying which one to go with for the past six weeks. I have not made this decision lightly. I also found a decent coupon that really took a bunch of money off that was a good thing too. I was originally planning on trying Blue Apron, which is cheaper at $60 for 6 meals-or $10 a meal. The drawback for me was you can't choose what meals you get. They pick them for you. I decided to try Plated, which is a little more expensive at $72 for 6 meals-or $12 a meal, but you get to pick what is sent to you. These are meals you cook yourself, but they send you all the ingredients you need but for salt and pepper and olive oil. Note to self-buy olive oil. There were pros and cons, positive and negative reviews for both sides. For me, I watch the Food Network all the time and fancy myself a foodie of sorts and Plated seemed to have fancier things that just appealed to me more. My first shipment will arrive February 6th and I've ordered Thai peanut curry chicken with sticky rice, Vietnamese Caramel fish with vermicelli and bok choy and lastly Creamy Quinoa grits with roasted Sumac squash. Don't those sound delicious? And hoity toity? I can't wait! With the coupon I found, I paid $42 instead of the $72. I've tried to use other coupons for future orders, but as of now I haven't found one they will let me use. So I'll need to decide whether to cut back to 4 meals at $48, or cancel all together. For me, this program will be a good thing I hope! Oh and an update on my Little House on the Prairie book? OMG is it painful to read. I've put it aside for now. You read a newspaper column of story, then there is literally 2-3 pages of footnotes and annotations. Now I realize the book is titled, the annotated etc, but no way did I think it was this detailed. For me, I just wanted the real story, I don't care about all the other crap. I may just skip all that for now and concentrate on just her words. Here's the silly bottle shot as I have nails to file down! 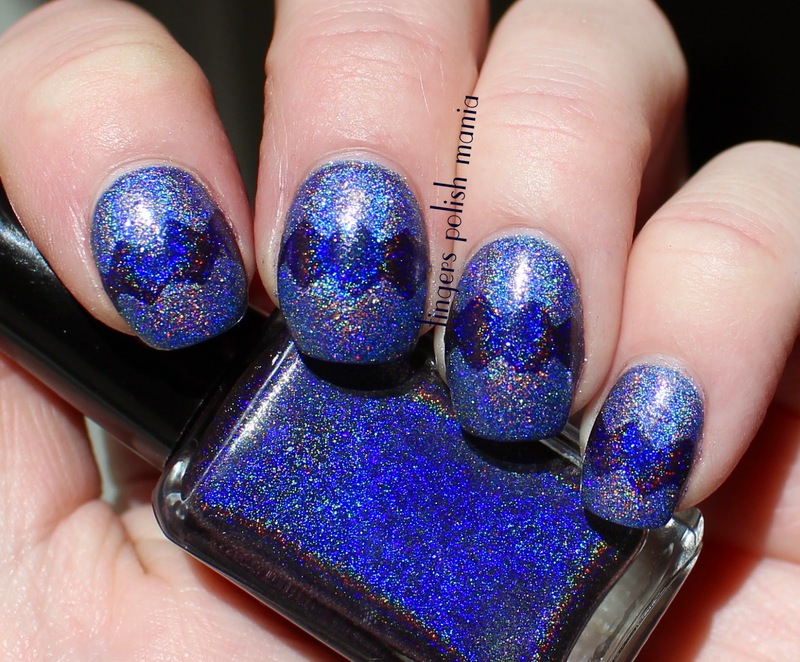 This is Enchanted Polish Dark Fantasy and Anonymous Lacquer After Party. I started with a full mani of After Party. 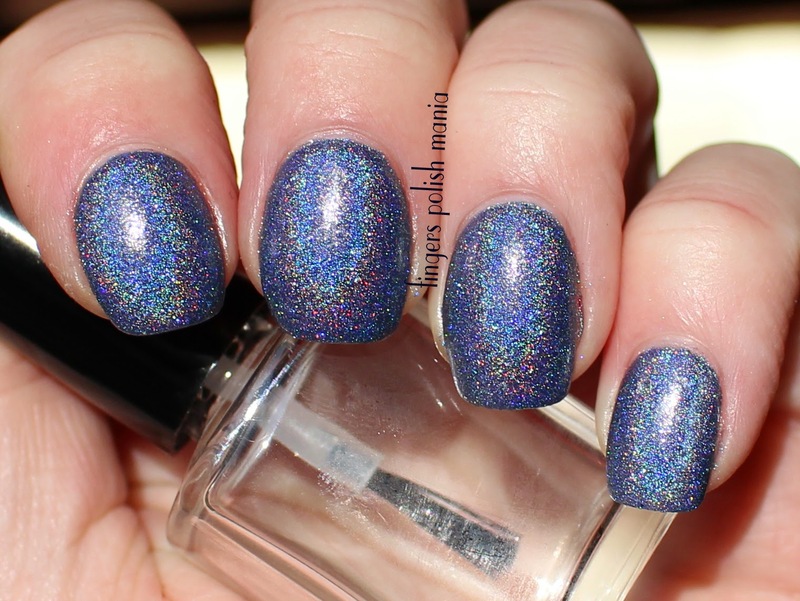 This is a gorgeous blue linear holo with holo micro glitter. It's a stunner! Trust that I couldn't capture the sparkles of this beauty-it is so much more in person. I didn't want to cover this up too much so I simply did a tape mani. So pretty. Don't you think?